Andronikos Palaiologos or Andronicus Palaeologus (Greek: Ἀνδρόνικος Παλαιολόγος) was a Byzantine prince and the last Byzantine governor of Thessalonica with the title of despot (despotēs), from 1408 to 1423. Andronikos Palaiologos was a son of the Byzantine Emperor Manuel II Palaiologos and his wife Helena Dragaš. His maternal grandfather was the Serb prince Constantine Dragaš. His brothers included emperors John VIII Palaiologos and Constantine XI Palaiologos, as well as Theodore II Palaiologos, Demetrios Palaiologos and Thomas Palaiologos, who ruled as despots in Morea. In childhood Andronikos survived the sickness which killed his older brother Constantine and two sisters. He never recovered in full, remaining in poor health for the rest of his life, eventually developing leprosy. When he was only eight years old his father made him a despot (despotēs) and appointed him imperial representative in Thessalonica, where he succeeded his deceased cousin John VII Palaiologos. As he was still a minor, for the first years of his rule there, until ca. 1415/1416, he was under the tutorship of the general Demetrios Laskaris Leontares. After John VIII assumed control of the imperial government in 1421, the Byzantine Empire faced an increasingly hostile Ottoman Empire. Constantinople was attacked by the Ottomans in 1422, and Thessalonica was subject to a long blockade in 1422–1423. 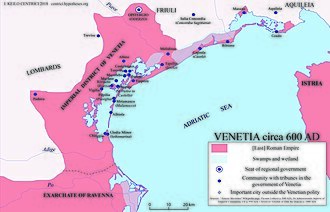 Under siege, and increasingly unwell, Andronikos began diplomatic initiatives for the surrender of the city to the Republic of Venice. These negotiations resulted (although he did not have the support of the whole of the population, and was opposed by the church, which mistrusted the Latins), in a Venetian force entering the city in 1423. 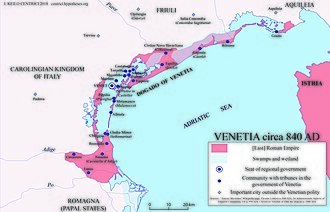 The handing over of Thessalonica to Venice contributed to the outbreak of the first in a series of wars between Venice and the Ottoman Empire. The Ottomans conquered Thessalonica in 1430. His fate after the surrender of Thessalonica is obscure, with conflicting accounts in the sources. The contemporary Venetian Morosini Codex mentions a conspiracy led by Andronikos to surrender Thessalonica to the Turks. The plot was discovered in November 1423, and Andronikos and his supporters were exiled, with the Despot sent to Nauplia in the Morea, and his supporters to Siteia in Crete, Andros, and other places. According to the Greek scholar Apostolos Vakalopoulos, this conspiracy may be identical to the imprisonment of four leading aristocrats, led by a certain Platyskalites, for their association with the Ottomans, as reported by the Byzantine historian Doukas. 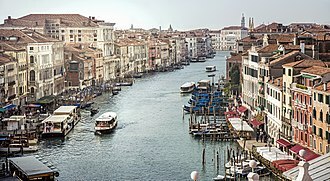 The four men were exiled, first to Crete, and then to Venice itself and Padua. The Byzantine sources do not mention Andronikos' involvement in a conspiracy, and record different fates for him: Laonikos Chalkokondyles records that he went to Mantineia in the Morea, where he died; Theodore Spandounes writes that he sailed for Venice but died during the journey; Sphrantzes claims that he became a monk in the Pantokrator Monastery in Constantinople, where he died in 1429 and was buried next to his father; a number of other sources, including Pseudo-Sphrantzes, claim that he became a monk in Mount Athos, specifically the Vatopedi Monastery, where he died. ^ Mertzios 2007, pp. 95–96. ^ Vacalopoulos 1973, p. 81. ^ Necipoğlu 2009, pp. 49–50. ^ Mertzios 2007, p. 95. ^ Setton 1978, p. 24. Wikimedia Commons has media related to Andronikos Palaiologos. Mertzios, Konstantinos (2007) . Μνημεία Μακεδονικής Ιστορίας [Monuments of Macedonian History] (PDF) (in Greek) (Second ed.). Thessaloniki: Society for Macedonian Studies. ISBN 978-960-7265-78-4. Necipoğlu, Nevra (2009). Byzantium between the Ottomans and the Latins: Politics and Society in the Late Empire. Cambridge: Cambridge University Press. ISBN 978-1-107-40388-8. Vacalopoulos, Apostolos E. (1973). History of Macedonia 1354–1833. Translated by Peter Megann. Thessaloniki: Institute for Balkan Studies. Manuel II Palaiologos or Palaeologus was Byzantine Emperor from 1391 to 1425. Shortly before his death he was tonsured a monk and received the name Matthew and he is commemorated on July 21. Manuel II Palaiologos was the son of Emperor John V Palaiologos. His maternal grandparents were Emperor John VI Kantakouzenos and Irene Asanina, granted the title of despotēs by his father, the future Manuel II traveled west to seek support for the Byzantine Empire in 1365 and in 1370, serving as governor in Thessalonica from 1369. The failed attempt at usurpation by his older brother Andronikos IV Palaiologos in 1373 led to Manuels being proclaimed heir and co-emperor of his father. In 1376–1379 and again in 1390 they were supplanted by Andronikos IV and his son John VII, although John V had been restored, Manuel was forced to go as an honorary hostage to the court of the Ottoman Sultan Bayezid I at Prousa. During his stay, Manuel was forced to participate in the Ottoman campaign that reduced Philadelpheia, hearing of his fathers death in February 1391, Manuel II Palaiologos fled the Ottoman court and secured the capital against any potential claim by his nephew John VII. 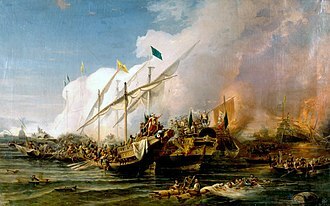 Although relations with John VII improved, Sultan Bayezid I besieged Constantinople from 1394 to 1402, Manuel II had sent 10 ships to help in the Crusade of Nicopolis. When Manuel II returned home in 1403, his nephew duly surrendered control of Constantinople, Manuel regained from the Ottomans Nesebar and the Marmara coast from Scutari to Nicomedia between 1403–1421. 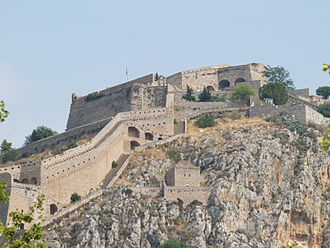 Here Manuel supervised the building of the Hexamilion across the Isthmus of Corinth, sigismund never rejected the possibility of fighting against the Ottoman Empire. However, with the Hussite wars in Bohemia, it was impossible to count on the Czech or German armies, Manuel II died on 21 July 1425. This mirror of prince has special value, because it is the last sample of this literary genre bequeathed to us by Byzantines, by his wife Helena Dragas, the daughter of the Serbian prince Constantine Dragas, Manuel II Palaiologos had several children, including, A daughter. Mentioned as the eldest daughter but not named, possibly confused with Isabella Palaiologina, an illegitimate daughter of Manuel II known to have married Ilario Doria. The Despotate of the Morea or Despotate of Mystras was a province of the Byzantine Empire which existed between the mid-14th and mid-15th centuries. The territory was ruled by one or more sons of the current Byzantine emperor. Its capital was the city of Mystras, near ancient Sparta. 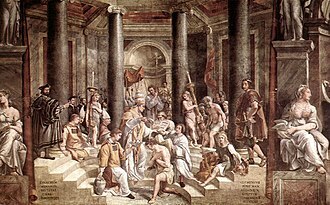 The Despotate of the Morea was created out of territory seized from the Frankish Principality of Achaea and this had been organized from former Byzantine territory after the Fourth Crusade. In 1259, the Principalitys ruler William II Villehardouin lost the Battle of Pelagonia against the Byzantine Emperor Michael VIII Palaeologus, William was forced to ransom himself by surrendering most of the eastern part of Morea and his newly built strongholds. 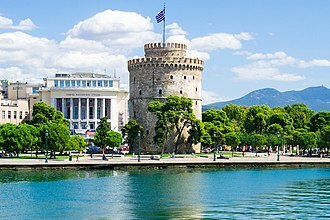 The surrendered territory became the nucleus of the Despotate of Morea, a Byzantine emperor, John VI Kantakouzenos, reorganized the territory during the mid-14th century to establish it as an appanage for his son, the Despot Manuel Kantakouzenos. The rival Palaiologos dynasty seized the Morea after Manuels death in 1380, Theodore ruled until 1407, consolidating Byzantine rule and coming to terms with his more powerful neighbours—particularly the expansionist Ottoman Empire, whose suzerainty he recognised. He sought to reinvigorate the economy by inviting Albanians to settle in the territory. Subsequent despots were the sons of the Emperor Manuel II Palaiologos, brother of the despot Theodore, Demetrios, however, in 1446 the Ottoman Sultan Murad II destroyed the Byzantine defences—the Hexamilion wall at the Isthmus of Corinth. 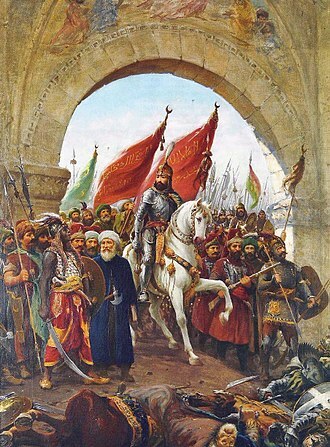 His attack opened the peninsula to invasion, though Murad died before he could exploit this and his successor Mehmed II the Conqueror captured the Byzantine capital Constantinople in 1453. The despots, Demetrios Palaiologos and Thomas Palaiologos, brothers of the last emperor, failed to send him any aid and their own incompetence resulted in an Albanian–Greek revolt against them, during which they invited in Ottoman troops to help them put down the revolt. 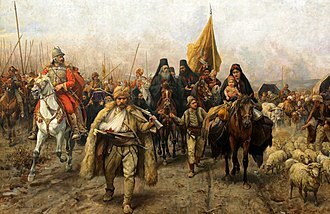 At this time, a number of influential Moreote Greeks and Albanians made private peace with Mehmed, Demetrios ended up a prisoner of the Ottomans and his younger brother Thomas fled. By the end of the summer the Ottomans had achieved the submission of all cities possessed by the Greeks. Amadeus V, surnamed the Great for his wisdom and success as a ruler, was the Count of Savoy from 1285 to 1323. He established Chambéry as his seat and he was the son of Thomas II of Savoy and Beatrice Fieschi. Amadeus succeeded his childless paternal uncle Philip I as Count of Savoy in 1285, Amadeus was a younger brother of Thomas III of Piedmont, who had died in 1282. Thomas had been succeeded by his eldest son Philip I of Piedmont who had a claim to the County than Amadeus. 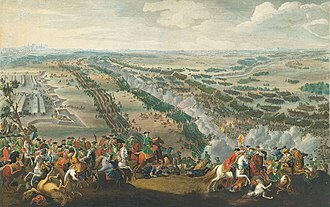 However Philip was about seven years old and at the time unable to press a claim, Amadeus managed to secure the support of his nephew by offering Philip control of Turin and Pinerolo. Amadeus secured the loyalty of his younger brother Louis by offering him Vaud as an hereditary barony, through his marriage to Sybilla, Countess of Bugey and Bresse, he was able to incorporate these Burgundian districts into his states. Later expansion saw his dominions further increased, on 1 October 1285, Amadeus was declared protector of Geneva after negotiations with the Bishop of Geneva. The hereditary title belonged to Amadeus II, Count of Geneva who was in conflict with the Bishop, in 1287 Amadeus besieged the castle of Ile in the Rhône near Geneva, and captured it after fourteen weeks. In 1295, Amadeus acquired the fortress at Chambéry from its previous owner Hugh of La Rochette and he brought Georges de Aquila, a student of Giotto from Florence, to his court. Georges decorated the castle with paintings, carved wood, and frescoes and he worked there for the Savoyards until he died in 1348. 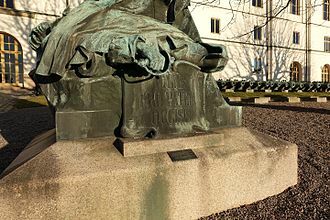 Among his successes was the Treaty of Annemasse which the Count of Geneva, the treaty was the result of military victories over the both of them. In 1301, Amadeus settled his dispute over control of Valais with the Roman Catholic Diocese of Sion and his reign, saw friction between the County of Savoy and the Duchy of Austria. He pursued an alliance with the Kingdom of France and received Maulévrier in Normandy as a result of good relations. The eventual recovery of Lyon by the Kings of France alerted Amadeus to their tendencies towards the regions by the Alps. This policy of the Byzantines was often used successfully in weakening their neighbours. When Murad II emerged as the successor to his father. 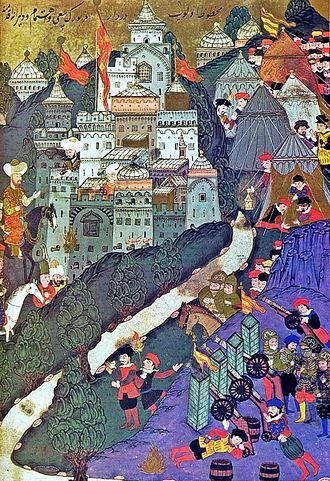 The Turks had acquired their own cannon for the first time by the siege of 1422, the two sides were evenly matched technologically, and the Turks had to build barricades in order to receive… the stones of the bombards. The Byzantine defenders won the battle, contemporary Byzantine tradition ascribed the deliverance of Constantinople to a miraculous intervention by the Theotokos. 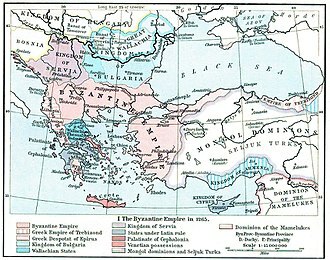 In spite of the Byzantine victory, the Empire at this time had in fact reduced to a few disconnected strips of land besides the city of Constantinople itself. It was facing economic problems and severely lacked soldiers. Pius II promoted the affordable donation of cannon by European monarchs as a means of aid, any new cannons after the 1422 siege were gifts from European states, and aside from these no other advances were made to the Byzantine arsenal. 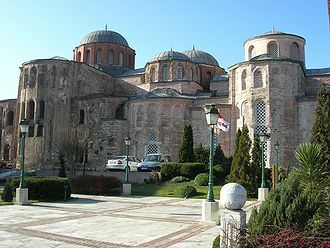 As such, the next Ottoman leader, Mehmed II, would be successful in 1453, Byzantine accounts attributed the lifting of the siege to an apparition of the Theotokos upon the city walls, which greatly inspired the defenders. Not to be confused with Anne of Savoy Anna of Savoy, born Giovanna was a Byzantine Empress consort, as the second spouse of Andronikos III Palaiologos. She served as regent during the minority of her son from 1341 until 1347, Anna was a daughter of Amadeus V, Count of Savoy, and his second wife, Maria of Brabant. She was betrothed to Andronikos III Palaiologos, during which time he was involved in a war with his paternal grandfather Andronikos II Palaiologos. He had claimed the throne since 1321, according to the history of John VI Kantakouzenos, the marriage took place in October,1326. She joined the Eastern Orthodox Church and took the name Anna, in 1328, Andronikos III entered Constantinople and finally deposed his grandfather. On 15 June 1341, Andronikos III died and he was succeeded by their son John V who was still three days short of his ninth birthday. Anna was appointed regent for her son, however Andronikos III had entrusted the administration to his advisor John Kantakouzenos. Anna did not trust the powerful advisor, at about the same time, Stefan Uroš IV Dušan of Serbia launched an invasion of Northern Thrace. Kantakouzenos left Constantinople to try to order to the area. In his absence, Patriarch John XIV of Constantinople and courtier Alexios Apokaukos convinced Anna that the advisor was her enemy. Anna declared Kantakouzenos an enemy of the state and offered the title of eparch of Constantinople to Apokaukos, Kantakouzenos was still in control of part of the Byzantine army. On 26 October 1341, he answered by proclaiming himself emperor at Didymoteicho and this was the beginning of a civil war that would last until 1347. Ivan Alexander of Bulgaria soon allied with the faction under John V, both rulers were actually taking advantage of the civil war for their own political and territorial gains. In time John VI would ally himself with Orhan I of the nascent Ottoman emirate, at the same time Anna was attempting to gain support from Western Europe. In Summer,1343 an emissary proclaimed her loyalty to Pope Clement VI in Avignon, in August,1343, Anna pawned the Byzantine crown jewels to the Republic of Venice for 30,000 ducats as part of an attempt to secure more finances for the war. Mount Athos is a mountain and peninsula in northeastern Greece and an important centre of Eastern Orthodox monasticism. It is governed as an autonomous polity within the Greek Republic under the official name Autonomous Monastic State of the Holy Mountain, Mount Athos is home to 20 monasteries under the direct jurisdiction of the Ecumenical Patriarch of Constantinople. Mount Athos is commonly referred to in Greek as the Holy Mountain, other languages of orthodox tradition use names translating to Holy Mountain. In the classical era, while the mountain was called Athos, the free movement of people and goods in its territory is prohibited, unless formal permission is granted by the Monastic States authorities, and only males are allowed to enter.6 square kilometres. The actual Mount Athos has steep, densely forested slopes reaching up to 2,033 metres, the surrounding seas, especially at the end of the peninsula, can be dangerous. In ancient Greek history two fleet disasters in the area are recorded, In 492 BC Darius, the king of Persia, in 411 BC the Spartans lost a fleet of 50 ships under admiral Epicleas. Though land-linked, Mount Athos is practically only by ferry. The Agios Panteleimon and Axion Estin travel daily between Ouranoupolis and Dafni, with stops at some monasteries on the western coast, there is a smaller speed boat, the Agia Anna, which travels the same route, but with no intermediate stops. It is possible to travel by ferry to and from Ierissos for direct access to monasteries along the eastern coast, the number of daily visitors to Mount Athos is restricted, and all are required to obtain a special entrance permit valid for a limited period. Only males are permitted to visit the territory, which is called the Garden of Virgin Mary by the monks, residents on the peninsula must be males aged 18 and over who are members of the Eastern Orthodox Church and either monks or workers. Athos in Greek mythology is the name of one of the Gigantes that challenged the Greek gods during the Gigantomachia, Athos threw a massive rock against Poseidon which fell in the Aegean sea and became Mount Athos. According to another version of the story, Poseidon used the mountain to bury the defeated giant, homer mentions the mountain Athos in the Iliad. Herodotus mentions the peninsula, called Acte, telling us that Pelasgians from the island of Lemnos populated it and naming five cities thereon, Cleonae, Olophyxos, Strabo mentions the cities of Dion and Acrothoï. Eretria established colonies on Acte, at least one other city was established in the Classical period, Acanthus. Some of these cities minted their own coins, the peninsula was on the invasion route of Xerxes I, who spent three years excavating a channel across the isthmus to allow the passage of his invasion fleet in 483 BC. After the death of Alexander the Great, the architect Dinocrates proposed carvingg the entire mountain into a statue of Alexander, the history of the peninsula during latter ages is shrouded by the lack of historical accounts. Archaeologists have not been able to determine the location of the cities reported by Strabo. View of Vatopedi monastery from the nearby beach. The Holy Trinity, fresco on the ceiling of the entrance (πρόστωον) of the katholikon at Vatopedi. Byzantine double-headed eagle with the Palaiologos family cypher. A miniature from the Louvre MS. Ivoires 100 manuscript, depicting Manuel II, Helena and three of their sons - the co-emperor John VIII and the Despots Theodore and Andronikos. Amadeus as one of the combattants defeating the Torriani revolt in Milan (12 February 1312). Dejan and his wife, fresco from the Zemen Monastery. The Byzantine Empire and the Latin and other states resulting from the Fourth Crusade, as they were in 1265. The Byzantine province of the Morea is also shown. (William R. Shepherd, Historical Atlas, 1911). Andronikos III Palaiologos, 14th-century miniature. Stuttgart, Württembergische Landesbibliothek.